I hope you all had a great weekend. I have a quick post for you tonight showcasing a card I made for the casethissketch challenge this week. As I am still in need of birthday cards, I decided to use this sketch for that purpose. And... how could I not be guided by the sketch? :-). I thought it was perfect for one of the Altenew butterflies that I have in my stash. These butterflies really are gorgeous. I was inspired by the color on the butterfly and made the stripes grey and yellow to echo the butterfly. I sponged the colors on with my new makeup brushes. I really do love how they blend so beautifully. Here's a closeup from the side. If you look really carefully, you can see that I raised the wings of the butterfly with some clear foam tape. I adhered the body of the butterfly onto the card base with some really strong glue - Gina K Connect glue. Once that was dry, I added a small piece of the clear foam tape to the very inside of the wings. That way, it will go through the post and the wings will still pop up again when the recipient opens the envelope. I kept the sentiment very clean and simple and used a small greeting from Penny Black's Snippets set. Then, I did a tiny butterfly in a matching color for the inside - with a sentiment from the same Snippets set. 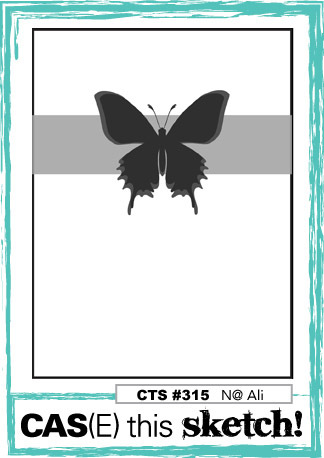 I really do love these Altenew butterflies and have been saving them for special cards and love the simple elegance they bring. I'll be back later in the week with more birthday cards! In the meantime, warm hugs and prayers for those of you who need a little lift tonight.